I confirmed the same thing happens on newer, smaller saves that only have bridges built to those areas, but was unable to keep a save file due to the consistency of the freezing. EDIT: Just saw V1.05 was released. Checked the same save file using V1.05 without changing anything else, and it still happens. I have seen were some items are getting stuck,and not floating down like there suppose to. I am sure reloading the game fix it but just thought you guys would want to no. srry if this is a duplicate report. Built foundation out to them and a few items i was able to reel in a few. Went back to my main raft, turned around and most had depawned but a second later a new group of stuff spawned and immediately got stuck. Not ALL are getting stuck. Most is still going through normal. Hello. I had a glitch where the shark attacked through my raft and started biting a net. It started because I was standing in a net by accident and the shark started attacking me, when I moved out of the way, he swam through the raft and started biting. Also, not sure if this is a glitch or intended... But you can no longer fall into nets, but the game still considered you inside because your get fatigued and the shark can attack. I was on a new world, still a 2x2 raft. The shark ate (Facing where the moon sets) the farther left foundation, and my raft dissapeared, so I was stuck floating about until i was eventually eaten. No idea what caused it, but was slightly annoying. Items in net become invisible! So 2 bugs: one is that when i open my inventory and after moving something is automatically reselected and i cant choose anything else till i close my inventory. The only time I get the 'fatigue'/swimming thing is when I'm walking over an item net. Are you getting this over normal foundation? I concur w/Lethann, I am also getting the same thing over the nets. Hi, I downloaded Raft and get the error that the Data Folder is not found. But the exe is next to the datafolder... Can someone help me please? I believe if you click on the folder (.zipfile) and then click up top "Extract all", it should tell you where its going, and find it to open and start playing. Does anyone know how to fix APPCRASH??? I noticed that new items spawning in sometimes appear for a split second near the player, typically to the west where the items spawn. When they do, nearby item nets can actually catch the items, though they'll be invisible in the net and 'stuck' out in the water until they're harvested. Then I'm very glad to have helped! It's most noticeable with barrels since they clip through the raft, though it happens to all items; I've seen thatch pop into a net I was standing by and get stuck out in the water until I harvested it. Also, the items won't necessarily go to the net in their lane; they can go to any net regardless of location. I have not tested with nets behind one another, only those in the same row. I'm not sure if player location is key to this bug happening, either; my raft is much bigger now, and even when I'm relatively far from my item nets, I'll have bugged items in them. I think I have less overall, but again, I haven't tested this. Thanks for the active work, I'm looking forward to the future of this game. Items disappearing from chests, cooking station, water purifier. Grown palm trees/beet/potato disappearing when saving and exit the game. I get the "fatigue" thing when walking on foundation. There's a bug where you will start getting fatigued even while standing on your raft. I don't know if this bug has been reported but, while in water, if you keep jumping, your stamina meter wont empty at all. Also, since last patch, i get bugged while walking really close to the water and it makes the character swim like it was in the water. 2. kinda hard with floor tool out to go up the ramp, it seems like the green floor showing placement, is colliding with the character. Updated to v1.0.5 Win-64 and now there are some items stuck around the item spawn area and can't be hooked or picked up. I am reposting this I think. But right after the first post because I don't know if it posted or not. Its a mac version problem. I don't think its my computer but it might be, when I just got the new updated version and the water is very messed up. It's weird. I just found out its when you put your texture thing before the game starts to "good". If you can make your game quality the best. (fantastic graphics) if you can't beautiful might work. A couple of things in V1.05. One, for some reason, after a brief period of time of playing the game, I see many resources that are stuck/piled up in one line(presumably at what would normally be their spawn points) that are not moving, nor capable of being picked up when I approach these objects. Secondly, after crashing from the game many times(probably due to noticeable lag and me doing something) I ended up losing my stuff from the chests, while the food that were left on the cooking stations and water purifiers disappeared, despite the fact that the food that I cooked(and the things in the treasure) was there when I saved. Is it possible for these problem to be fixed? This is a gpu/driver problem normally (artifacts on screen). Are you experiencing it in other graphics intensive games? Game bug you can't get out of the wood when you're on board. So, I downloaded the game, but it just goes pink when I start the game O_O Like, there's little fires and they spin, but everything else is pink. I don't know why, I have re-downloaded the game 3 or 4 times and it's not fixing it. Did you try restarting your game? There is a bug! Sometimes player swims on raft. Been playing the game a few days now and want to say it's great, and great job. One small issue I've noticed is that the new update 1.05 seems really resource heavy all of a sudden (I'm running an r9 390 and the fps counter varies between 1-14fps on highest settings). Could just be to do with the updated water but thought I'd pass it along? There is a pretty basic issue here with the hand model disappearing when the spear is equipped, this happens when you look on line with the horizon and pan the camera left or right with the spear equipped. This bug doesn't seem to happen with other items thankfully. A second issue within this video is the fact that i was receiving almost no floating debris, this continued for the rest of the play through until I eventually died from starvation because of this issue. I hope issues like these can be easily fixed in a future update as I have really enjoyed this game so far and see that it shows great potential, keep up the good work guys! I tried to open raft at a normal Picture quality but it instantly crashed. After a few hours of trying it in all resolutions and qualitys I found out that I could open up the menu at thebest settings but when I was playing it was lagging very hardly. Also my hotbar was made out of white and purple Pixels. When I go to download the error "network failure"
Another thing is that when a collect materials from the nets,sometimes they appear invisible,and the net marks me that there is something and it not just one thing,sometimes is more then 3 materials that appear invisible. OOoooo... Ooooo! I didn't notice this but I'll have to test it out. Quite a few of us have been reporting items stuck along the spawn point. Some others are reporting invisible items in the nets. I wonder if these are related now. Perhaps items getting caught in the nets are having their visuals spring back to the spawnpoint but the reason why they can't be picked up is because they are actually in the nets! I remember after building my bridge out to the stuck items that I came back to my raft and next time I looked all the stuck stuff was gone. Maybe that's because I had emptied my nets! Must go test this out! Some of the items can be picked up and are still forzen, just thought id mention it. My Item Nets dont work. They are collecting Items but if i try to pick them up it doesnt give me the items and they are still in the net. Can I delete the files from 1.04 or do I lose my save files by doing that? you won't delete your saves as those are kept somewhere else. Sometimes this bug happens when I'm walking through the foundation. The fatigue counter appears on the top, and this only appeared when it was in water in version 1.04, but in this new version is also appearing out of water. I got a trouble in the version 1.05. The barrels spawn on the horizon but they don't approach the raft and they are too far to be got by the hook. I built a bridge to where the items spawn, and most of them can not be caught, it's like they render in the video but were not there really. There are invisible items in the net, i don't know if there are any in the net until I hover over and it says collect, this is not for all items tho, I would say the ratio of visible and invisible is about 70-30. Apart from that all good. <3 keep the good work up. I can't figure out how to search these threads, so if this has been posted before, my apologies. When crafting: If the material has more than one stack and the first stack in the inventory has less than the amount needed for the item being crafted, the smaller stack will be deducted, as well as the full amount from the next stack in the inventory. Example: I want to craft a chest, so I'll need 8 planks and 10 scrap. In my inventory, I have two full stacks of planks, and a stack of 5 scrap as well as a full stack of scrap, in that order. When I have crafted the chest, I'll have a stack of 2 planks as well as a full stack, and I'll have no scrap left. If I make another chest, where the full stack is before the half stack, only the full stack will be deducted. Smaller example: I want to craft a rope, which takes 2 thatch. I have a single thatch, as well as a full stack of thatch in my inventory. When I've crafted 1 rope, I'll have a stack of 8 thatch left. Same as above, if the full stack is in front of the single thatch, there is no problem. How to reproduce: Just put a stack that contains less than you need for an item you want to craft in front of a stack that has the needed amount or more. I have had the exact same thing, i actually came here to report it but i see you beat me too it. Ive noticed it mainly with the chests and the scrap used to make them. I had 27 scrap on me at one point, i made a chest and ended up with 0, not sure what caused it to use 2 full stacks as well as stack of 7. Hello I am having an issue with not being able to empty my nets. It started after the new update. The first time I played it would let me empty the nets but not let me collect items I hooked. Now the second time I'm playing I'm having the opposite issue. There's this bug where when you craft any item, it will consume extra unnecessary materials only if you have 2 slots or more of the required material needed to craft that item. Here's how the bug occurs: If Slot A is full (max. 10) and Slot B contains less than the amount required to craft the item, crafting the item will make the game ignore Slot B and instead subtract the required materials from Slot A, at the same time consuming Slot B. Imagine this scenario: I want to craft a nail, which requires 3 scrap metal. I have 2 slots of scrap metal – one is full (slot A), the other contains only 1 (slot B), so total 11 scrap metal. By crafting the nail, the game ignores the slot B, since it contains less than the required material, and at the same time consumes it, then subtracts the amount required from slot A. Thus I will have only 7 scrap metal left. Another scenario: I wanna craft a spear which requires 4 scrap metal. I have 13 scrap metal in total so I will have 1 slot with a full stack of 10 and another slot containing 3. By crafting the spear, since the slot containing 3 has less than the amount required (4), the game will ignore and consume it and then subtract the amount required from the full stack. Thus I will have only 6 scrap metal left. I've tested this bug with the spear, hatchet, rope, empty tin can and the nail and it produced above result. I assume that this bug applies to all other items as well. Edit2: This bug was present in the previous version as well. Oh my bad! i'm new to this community and i can't find a way to navigate efficiently through the sea of bug reports. i saw your post and you explained the occurrence of the bug better than i did. Every time i load the things in the chest disappear PLS FIX IT! have you thought about making this game for console?? I was trapped under the raft and slipped under the world and died. video available on youtube. I make backup saves, hope you don't mind. Hello, my game crashes as soon as I try to start it. How could I fix it, all help is aapreciated. If I cannot fix it could someone link me an older download. Hi. This is a very nice game. I have the 64x Windows 1.0.5 version and i'm stuck in a foundation. I was placing it when i was in that area. Now i'm stuck and i don't know what to do. And i don't want to delete the game. Since I have gotten the V 1.5 update, The water has rainbow static where the sun reflections are supposed to be. It worked fine before I got the update. i need help i can´t to download the the new vesion of the game for win 10,64 bits its download error can you help me? I can not download the game! When I'm going to download, it's forbidden to help me. i have a problem that there is the items that float ,and they just stucked, but more items are moving to my nets. ps: i also can drop the hook and grab them. when coward the itemes in a chest and you save the game and exit when enter in your world the itemes are not in chest. SOLEVE FAST!! You can't kill the shark with a spear because after a while the spear lose his power and texture. And if you hold a item net you can hold items in it without placing it down. for some reason i can not collect my nets, i have to break them with an ax to collect the items. I've run into a bug where sometimes when I log back in all of my stored items are gone. Anything in a chest, a crop plot (including trees), a cooking apparatus (any food I was cooking and any tin cans I had in water purifiers), etc. It keeps all of the items in my inventory and in the nets (I think), as well as any objects I've placed or structures I've built, but nothing else. This has already being reported above. Am I supposed to read all ~600 posts in this thread before I make a post myself, or should I actually tell the developers the problem I'm having? The only ones I saw similar to mine involved game crashes, and my game never crashed, it just happened randomly. Seems different enough to me. If this exact thing has been reported before, I'm sorry. But, it's way too difficult to go through and find another post exactly like mine, when I can just post it myself. Save game won't let me load ~ "Dead"
I have to start over again on purpose or bug? You have to start again yeah it isn't a bug. Your character has died so you can't play that game anymore. So watch your food and drink! When i'm in the game like 3 mins into the gameplay my inventory won't open anymore only when i go back to the menu and back in the gameplay. I think this is a bug. The crash report folder named "2017-01-28_131636" next to the game executable. It would be great if you'd send it to the developer of the game"
There's a bug where sometimes when items are caught by the item nets they are invisible and you can't see them. In 3 and next days I just can't use spear versus Sharks and it's always breaking my foundations :( Please help. I was building out a raft trying to find the end of the world and I fell in. Somehow, I managed to build over my head and since the water has no depth, I died. I couldn't move if there was a piece of raft over my head. After using all the durability of both the axe and the spear, throwing them away and then crafting new ones results in the new ones both having no durability. The spear is unable to attack the shark and the axe still can't chop down the trees. First of all, thanks for the game, it is really awesome! I noticed, that sometimes there items in the water that do not flow towards the raft. I've built foundations so I can reach these items, but I can not pick them up. There are items that flow towards the raft in the meantime, so items flow next to the items stuck in the water. Thanks, and keep on beeing awesome! Hi, i want to download this game on my acer laptop but the download link just won't come. (i have this by other games on this site to) what can i do about it? Hi i just started playing this game and its really fun but it looks like all the works going to windows and I'm on mac maybe you can update the mac version too? Thanks. When I try to grab stuff from the net i cant! Why are all the updates for windows! Im on a mac and I'm starting a youtube channel and the chests don't save so if i do work off camera i come back and say "hey guys I've been doing work off camera and theres lots of stuff in the chests" i look in the chests theres nothing in there!!!!! please update for mac. Thanks for fixing the chest bug I'm so happy!! Thanks! I have tried many times over to download the game but for some reason it says I don't have permission from the server to download it. It keeps saying "Network Error" and when I click resume it says "Forbidden" but I can download everything else just fine. this is a link to a picture of what my title screen looked like. someone made copies of your game and is cashing in on it with tons of ads. Hi , i've recently noticed that when you stand on the edge of the raft or on the edge of a net , the shark picks up and attacks you even if your not in the water , unfortunately I Don't have video proof of screenshots but I also saw that when the shark tries to attack he actually hurts. I also wanted to point out as a future idea , Could you add a red effect around the screen when we are low health or take damage? because when the shark is attacking it's hard to tell if you lose health unless you look at your health bar.. I ran into a bug where my character will pull the hook out of the water, only to drop it immediatly afterwards despite me not clicking. I then have to reel it back in and hope it doesn't do this again. This can be annoying as he can even do this while I'm charging up a throw, resulting in me throwing the hook at half the power I needed. It once even set me back quite a bit, as it prevented me from pulling out my spear, allowing the shark to destroy my water purifier. Other than that, I really like the game and its alot of fun! I'm not sure if this is a bug or not, but the game is extremely laggy for me. I turned down the water graphics as low as they could go, and turned off the sun beams in the options, but the game still never gets about 12FPS, despite setting the game to run on the fastest possible setting on starting up the game. Is there something I could do to help speed the game up a bit? eu baixei o raft e fica travando de mas, eu deixo tudo no minino e msm assim trava mt alguem me ajdua com isso porfavor oq eu faço ?????? I'm sorry I post this in bug section but can u add 32 bit Windows multiplayer please? Hi, I'm with this problem. The crash report folder named '2017-01-132404- next to game execultable. Please fix the bug where if you build floors next to stairs it prevents you from going up the stairs. I think it has something to do with collision. Im having an issue with the save files i can only play on one computer with a save not multiple, i move the saved game to a memory stick and it wont read the save file unless i go back to that computer. plz make it o you can use the save file on other computer. I just downloaded the new V1.05 and I found that when you are holding left click to throw your hook out the hook half goes out, comes back then throws. On the Mac download, the server is very laggy and I am unable to move very much at all. In the main menu the game looks like this. And within the game it looks like this, although it gets worse when I look and move around. It looks like this no matter how I change the settings in the launcher or in game, windowed or fullscreen. I'm using an RX 480 with it's latest drivers, a 6600k @ 4.3, and 16GB of RAM on Windows 10. Hello soon took off and Demp game to play multiplayer game. The problem is as follows wanted to add an old save the game, but when pressed Select Save does not go anything and have at least 2 or 3 saved games. How to load an old card Multiplayer game ?? I have a chest bug here. I had like 14 chest (3 for each resources) and has filled up the chest. When I logged in yesterday all my items in chest are gone. only the items in my inventory were with me. i cant collect things from my nets. every time i start the game (also in the main menu) there's a pink screen, ik can do everything in the game, but i can't see anything because its all pink. Please, please fix that, its really annoying. Hmm, though I believe this is a bit of a problem revolving around player collision with both the nets and the water... Basically when you stand over certain spots on the net, you end up getting fatigue despite the fact that you're not really swimming. While it's not such a major problem, it does get a bit er... Strenious when you have a big row of nets and are trying to get stuff without drowning yourself by accident. I am unable to attack the shark with my spear, I have crafted a new one and it still doesn't work. I have tried throwing it on the grand and putting it into a chest and it never allows me to hold it in both of my hands. It only holds it like the hammer or fishing rod. Greetings. I'm not entirely sure if this is a big issue, but during game play, I've stumbled upon a bug with the nets. After crafting and equipping the net, you are able to capture salvage without placing the net down. Wherever the net is able to be locked in for placement when highlighted either red or green is when it works. After holstering the net, it still has the salvage in it, Even after placing it down. i have been playing for about 30mins if that long, started a new game from the start, dont have alot built but i can no longer build anymore because the panks have stopped showing up. 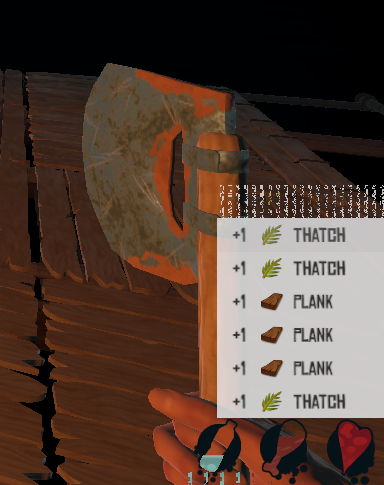 I have waited about 3 day/night cycles and i have gained literally 1 plank out of a barrel. yeah i tried a few things after posting, and i saved my game and restarted it and it was fine, now if anything acts up ill just restart it and just continue about my game. I wish they would add more planks and kinda back off the scrap just a tiny bit but atleast now with the lantern and stuff we have a decent use for the scrap. I just downloaded raft and when i try to run the game, this pops up in the crash folder. A little help? I cannot download the game whatsoever. It just says "access denied". What can I do to fix this? vzybilly@vzy-Lubuntu-Laptop:~/Downloads/V1.04_Raft_LinuxUniversal$ echo "Exit Value: $?" I recently noticed that when I went to build a tree croplet, it didn't consume the nails to make it. I have a problem spear doesnt work if i try to use it doesnt work.. When i play with my friend, i notice one thing, for example if i host the game, shark will attack only me and hes even not thinking about attacking my friend :), and cmon guys !! add some more items :3, awesome game ! I need help i can't pickup items from itemnet what do i need to do so i can pick up them???? I don't know if this is the correct place to put this or even if its something wrong with the site, but I can't download the file, I've tried it on chrome, IE, and firefox but it keeps saying it failed with "Forbidden" error. but I'm signed in. Happen to know anything? i found a bug. How can i post pick ? When i build and i have a water purifier or a cooker i can't remove it.I don't know if this is a bug or if i don't know all of the controlls. When i build and i have a water purifier or a cooker i can't remove it.I don't know if this is a bug or if i don't know all of the controls. Font issue when picking up too many items at once. I don't know wether to post this in bug reports or suggestions so I'm gonna just post it here. This game runs TOO smooth. With my FX6300 and my Zotac GTX 1070 Amp Edition OC'ed to 2000 Hz I am reportetly getting (Observed with CAM) something between 6000-8000 fps. This is a HUGE problem though. Even tough my GPU runs Watercooled with a 480mm rad it gets up to 53 Degrees. In Heaven Benchmark its a max temp of 43 and GTA V its about 38-39. Since the graphics card is rendering all 6000 frames aka as many is it possibly can it obviously gets hot. I've installed the newest version and this game is slower than a snail! What you need to do is compress the amount of bites it uses, i have a great site you can use to do this, the only snag is it has to be in pdf form when you do but you can always convert it back to whatever type it is. Also using the mouse to move the camera makes this game completely impossible to play, if I'm not looking straight down then I'm looking straight up which makes it impossible to swim because then i can never get back on the raft, which is another thing, there needs to be an option to pull yourself up instead of jumping because then you just over jump the raft, land back in the water, and die from shark attack. Quick bug! I was in the water when I placed another foundation and I got trapped under it and was killed by the shark! I know it's a weird glitch but I just wanted to make you aware of it. After saving the running game is restarted my computer. Since then he has changed the name of maturing games OldVersion-Mart and the game does not start. Yup, I'v got the same bug, the yet-to-be-placed floor acts as a solid entity, so you will be able to float in midair. It is even worse if you have a floor next to the staircase, so you will hit your head on the green/red floor when walking up. 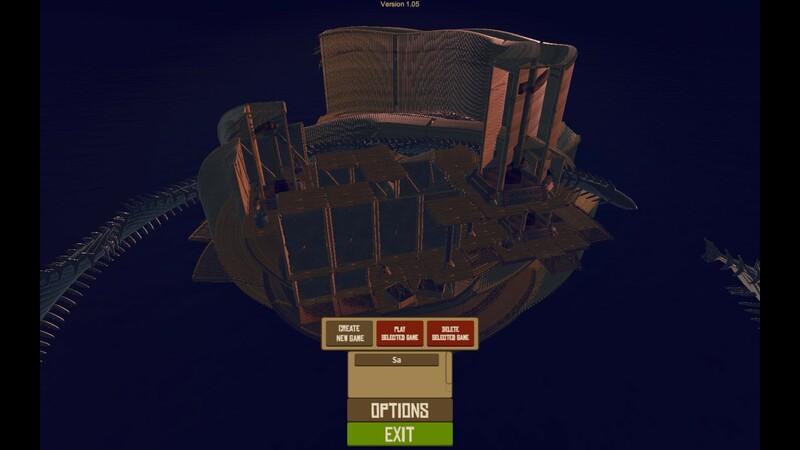 At the start of the game sometimes not enough scrap spawns to actually progress or even stay alive, also after one piece of foundation is destroyed by the shark if another corner piece is destroyed and you don't have a build tool. the who;e thing goes down and it's game over. When playing the items flowing to me stop at the ocean and when I go to pick them up by hand it doesnt let me pick it up and they stay there after exiting and starting the game up again. Other than that great game keep up the good work. Please help me i can't pick up items from item net what should i do??? When I'm downloading the game (I have a 64x Windows (Lenovo) Laptop) I'll go to run the program to install/play it (after downloading it) and an error shows up saying it could not find a data folder. Despite this, I was staring straight at the data folder, does anyone know why this is? I've had Raft V1.04 for Linux 64-bits running on my laptop. This worked fine with the standard configuration, albeit with a really bad frame rate. For this reason, I enabled the GeForce card in my laptop. I left out the stack trace and the further debug info - please tell me if you need it. As mentioned, Raft worked fine with the generic Mesa drivers, but with a really bad frame rate. I installed the proprietary NVIDIA drivers and then then core dumping ensued. The funky 3840x1080 dimension is due to my setup with two adjacent HD monitors. I tried it with one monitor as well, the crash still happens. This should do for now; I hope this is of some use. Please tell me if I can be of use by supplying further info. Sometimes the animation for the hook bugs out, it makes it look like I threw the hook without the rope, and then every other time I throw the hook, it doesn't animate properly - it looks like I'm still holding it. Second thing I've noticed - my spear has stopped working. I even made a new one, but it still doesn't animate or attack the shark when he attacks me. When I start my Game it simply crashes and an "Oops" appears with a phrase saying that I have to report this to the developer. Quando eu abro meu jogo, ele simplesmente crasha, o que pode ser? The menu for the builder hammer doesn't work for me and I'm using it on a macbook air. I tried clicking the right area of the touch pad but it doesn't do anything. So all I can build is more rafts. Any suggestions? I wanted to build a long way out from the raft, I wanted to find out how far away can I go, but when I builded the way the items stucked in a line in the water. Not every item, but some of them bugged there in an invisible barrier, I cant hook nor grab it. I have made a save game and gone back in and now the e button doesn't work to collect items from the nets but it does work on cooking and water. I got the game and i put the settings from the beginning to the fanciest one but i need to make it lower bc I get like 10 fps. found one! soo everytime I load my world a tree keeps growing on my cropplot! i can't download the game :( can anybody help me? or do i first need to donate before i can download the game? Around an hour to 2 hours of game play the planks stopped spawning as debris In the ocean! The only way to get them now is just hoping that barrels will have planks In them until I get 8 for a tree cropplot.... Is this an intent for the game to be tougher or a bug? Health of attacked net won't show (when we use hammer with the function of repairing). It works just fine when we just hammer it, we can repair it until it's full health. Hey guys, I've been doing a Let's Play series and in this episode I encounter a loot spawn bug so I figured I would post it here for you to have a butchers. It seems that when holding a fishing net ready to place, you can catch the loot in it, seemingly as much as you want too and then place it. This seemed to also cause the loot on the horizon to freeze, I can't say whether they were linked or whether they are two separate bugs but here's the footage for you to see. Skip to 06:15 for the bug. I keep running into a bug where I randomly drop through the foundation floor and I cant get out of the water. I cant swim to the edge of the platform or break the floor above me. The shark just kills me and ends my game permanently. This has happened in two separate games. The first game I had a two level raft 35 x 35 and the second time was 24 x 24. I'm running 1.05 x 64 on windows 8.2. Visual glitch how do i fix it?